My life changed irrevocably on September 24, 2013, at 6:21 am, when I posted my first blog post. For more than four years, I’ve chronicled my adventures, faith, and the work of God in my life on a daily basis. I’ve shared my highest highs and lowest lows, my griefs and joys. The blog will soon move to my personal website. It’s considerably more modern and more beautiful. This blog space, however, is very precious to me. Last night, I spent several hours in the “old” blog’s archive, and realized the photos represented every major event of the last four years. My fledgling attempts at fiction writing, my son’s graduation from college, the time The Clay Papers e-book went to #1 on Amazon and stayed there for four days, my dogs, my trip to the Bahamas, my trips to Jordan when I fell in love with a nation and her people, holidays, Bible studies, volunteering, becoming a missionary, caring for Sam… Everything is documented in the photographs I’ve shared. As I roamed through the digital archive, I re-read the stories, as well. You’ve lived life with me, and I’m eternally grateful. I hope you’ll continue through this transition and beyond. You’ve made me a better writer, because you’ve been such faithful readers, and I hope I never stop thanking you all for such a precious gift. My trip down memory lane took me inevitably to my first blog post, when I trusted God and you with my writing. I’m still grateful for that leap of faith. Reading it again was a blessing to me, so I’ve included it below. I hope it’s a blessing to you, as well. Thank you for making my life so very rich and full by reading and loving what I write. The shrubs and landscaping in front of my house were overgrown and threatening to completely block the sidewalk. It seems crazy now, but even though it looked messy and was becoming an azalea jungle, I couldn’t figure out how to fix it. I didn’t realize it, but I needed an expert. My friend, Linda Buchanan, mentioned her new yard man one day. Mr. Bailey was a wonder and a great help, she said, so I called him. That first day, I instructed him to clean up the front and trim the shrubs a little. I had no idea what he was about to do. A few hours later, I walked outside to see an enormous pile of brush. Mr. Bailey had trimmed more than I expected. My heart sank as I thought, “My azaleas! 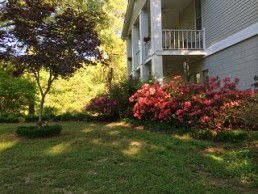 He has cut down my azaleas!” I hurried around front to find, not destruction, but order. He had trimmed up the mess and brought it under control. Instead of a jungle, I had lovely landscaping again. John the Baptizer’s listeners were in a similar situation. They knew they had a mess in their lives and that something needed to be done. That’s why they had come out to the banks of the Jordan to hear him. Their heritage wasn’t enough to save them, nor their sacrifices. They were in a quandary. What then? What could they do? He began by giving practical examples of sacrificial behavior. Shortly, however, Jesus would come for baptism, and John would recognize exactly what they all needed. The Lamb of God would take away their sin. They couldn’t do anything to rectify their guilt but Jesus would do it for them and He would soon set them free. Maybe you, too, are wondering what to do about problems in your life or in the lives of loved ones. You may not realize it, but, like me, you need an expert. The answer is incredibly simple. Look to Jesus. He can clean up the mess of your life as well as that of your loved ones. He can clean up the guilt and shame and set you free. Today, let’s pray for a heart willing to accept the kind of divine pruning only Christ can do.